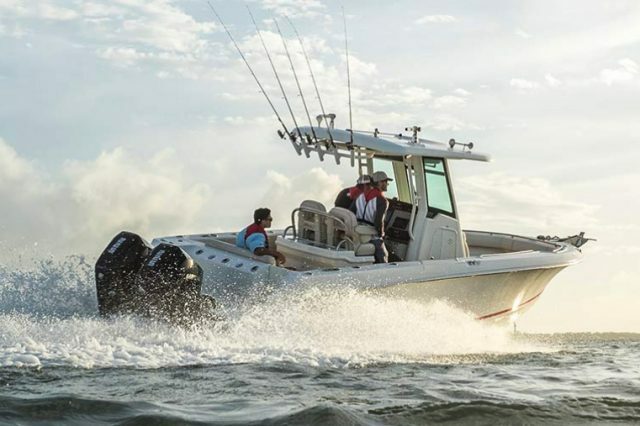 It was just a few years ago that Mercury Marine introduced some eyebrow-raising engines like the 400R outboard and the Optimax diesel, yet their 2018 introductions are even more surprising: an entire new line of Mercury FourStroke outboards. We’re not just talking about one new block. 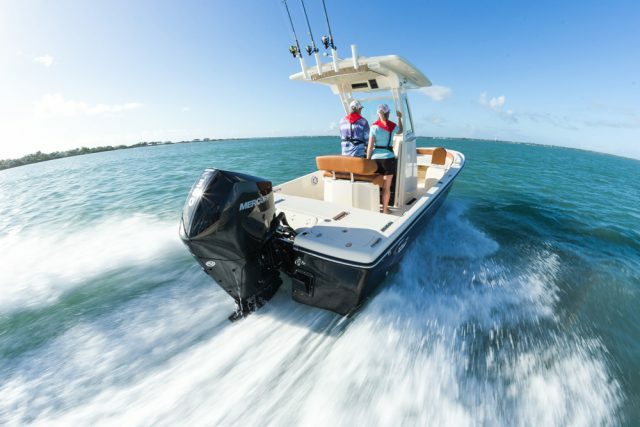 At the Miami International Boat Show in February, Mercury rolled out 175, 200, and 225 horsepower V6 engines. Then just a few short months later, they dropped the curtain on an all-new V8, available in 250 and 300 horse models. 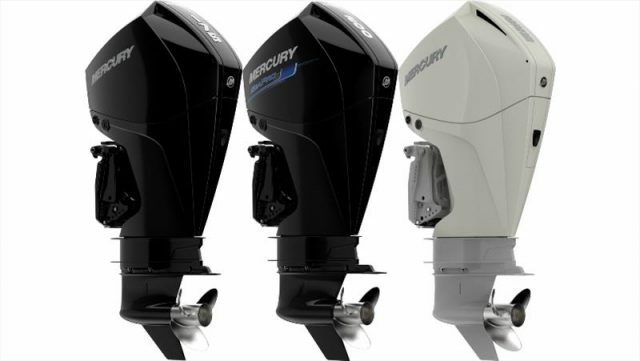 One glance is all it takes to realize that these are some very new and different Mercury outboards. Unlike Mercury’s Verado line these new FourStroke models are naturally aspirated, and make their power with displacement instead of a supercharger. This does not, however, mean that they completely replace all of the Verados. There are plenty of Verado fans out there and they can still get their fix with the 350 horse model. And yes, the 400R is still available from Mercury Racing. The V6 and V8 FourStroke lines share a few commonalities. Both have 64-degree cylinder banks, are DOHC engines, are available in 20-, 25-, and 30-inch shaft lengths (except the smaller V6s which come in 20- and 25-inches, only), are fitted with 85-amp alternators (that put out 20 amps even at idle), have 3.6-inch by 3.4-inch bore and stroke, are available with either power or hydraulic steering, and can mate up with either mechanical or digital throttle and shift. They also share a new cowl design that, quite frankly, make so much sense one wonders why it took so long for an outboard manufacturer to come up with it. There’s an access hatch in the top which makes it possible to check the oil level without wrestling off the entire cowl, and a single latch release design. You can pop it from that top hatch, so you no longer have to balance yourself aft of the transom to pull a cowl while out on the water. Cowls are also available with numerous side panel accent colors and four different base colors, taking a cue from the popularity of the multicolored and semi-customizable Evinrude G2 outboards. Color choices are part of the deal, with the new Mercury FourStrokes. Putting aside these similarities the V6 and V8 versions have a few significant differences. The V6, which won an NMMA Innovation Award upon its introduction, is a 3.4 liter engine, and swings its props through a 1.85:1 gear reduction. The V8 displaces 4.6 liters, and has a 1.75:1 gear reduction. The biggest question in a lot of people’s minds will, naturally, be weight. With the shortest shafts available (which is how Mercury chooses to publish engine weight) the V6 comes in at 475-pounds and the V8, at 527. As a point of reference, remember that the supercharged 2.6 liter Verado 350 weighs 668-pounds. Now compare that to 727-pounds for the Suzuki DF350A and 952 pounds for the uber-powerful new 5.6 liter V8 Yamaha F425 XTO outboard, or 551-pounds for the 4.2 liter V6 Yamaha F300. The new Mercs managed to lose a significant amount of weight as compared to older models – and as compared to the competition. Yes yes, we know – the weight-savings seems completely counter-intuitive. We’ve all been told for years and years that four-stroke outboards were relatively heavy and more displacement meant more weight. Now, we have a 4.6 liter model that under-weighs a 2.6 liter supercharged model, as well as a comparable two-stroke? Times have changed. The 250 and 300 horsepower V8s will also be marketed under the Verado banner, despite their radical differences from the Verados of yesteryear and the currently offered 350. These models will essentially be positioned as top-of-the-line versions with a few extra perks offered as standard features. Digital throttle and shift, electro-hydraulic power steering, a 115-amp alternator, and an oil level check on start-up are all included. They also feature what Merc calls Advanced Sound Control, which is basically the ability to circumvent the muffler to give your engines a throatier roar. Mercury has traded in the supercharger for sheer displacement, in the new V6 and V8 models. These Mercs have a few rather unusual features, too. Adaptive Speed Control keeps engine rpm stable as you go into turns or hit big waves, so no throttle-jockeying is necessary to maintain a constant speed. They fit on 26-inch centers – a result of that svelte 64-degree cylinder bank design – so a pair can be squeezed onto a transom that was designed for older two-strokes, or one which might otherwise only be able to accommodate a single engine. They’re noise-shielded both via the cowl design and also a multi-chamber intake system. And a closed-loop fuel control utilizes a wide-range oxygen sensor to deliver the best possible fuel/air ratio at all different rpm ranges. 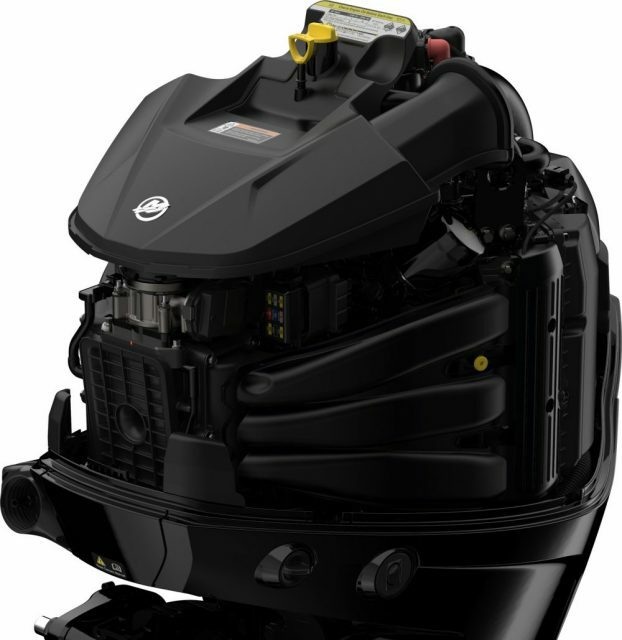 The new FourStrokes aren’t re-dos or tweaks; these are a fresh design in naturally aspirated outboards. As far as fuel economy goes, we’re not willing to stake a claim just yet. Merc is saying these engines trounce the competition to the tune of 12 to 16 percent, but honestly, what company doesn’t say they have the best fuel economy when they roll out a new offering? It will take time and numerous runs on various platforms before we’re going to make any final assessments, ourselves. 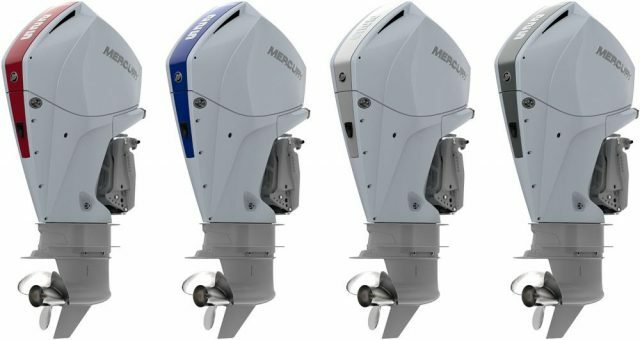 So just how much will these new Mercury FourStroke outboards set you back? The V6 starts at an MSRP of $17,425. But as far as the V8 goes we’ll have to save the drumroll for later – Mercury hasn’t released a number just yet. There’s more info to come people, so stay tuned. 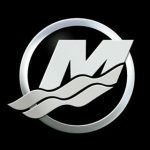 To get the company line, visit Mercury Marine.